Oh! Here I am, back again after what seems a frenetic and frantic time. Oh, yes, life sometimes throws things our way that knocks all the writing to pot – including the blog. In this case my father’s sudden eruption of a HUGE ulcer on his tongue, followed by numerous and sequential trips to the hospital for every type of scan, followed swiftly by an operation to remove a largish bite of his tongue and several lymph nodes from his neck following the diagnosis of cancer. Thank goodness for the NHS! Subsequently we’ve been on the recovery stage – trying to regain weight lost while eating was difficult – while eating is still difficult (with sore but healing new shaped tongue) However, things are stabilised now and I have found my lap-top and returned to all of you. And returned to the studies of everyday plants that my character – Dominica – might be able to use in her healing around AD689 – and today I’m looking at the plant known as the navelwort – or pennywort. I have always rather liked this plant. 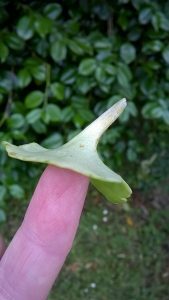 The round fleshy leaves are one of those edible leaves that my boys readily took to eating just for fun (after being told they were edible) They taste a bit cucumbery.. basically fleshy, wet and green, not bad in a sandwich. However, I didn’t know of their medical usage. The names, pennywort and navelwort I assumed came from their shape and the dimple, like a bellybutton, in the middle, even though, somewhere in the recesses of my mind the ‘wort’ rang a herbal-use bell. Now, the mini-course I went on tells me that the navelwort, Umbilicus rupestris, have strong antimicrobial properties and would have been placed over the end of the umbilical cord and tied on, where they would dry-on forming a seal and keep infection at bay. 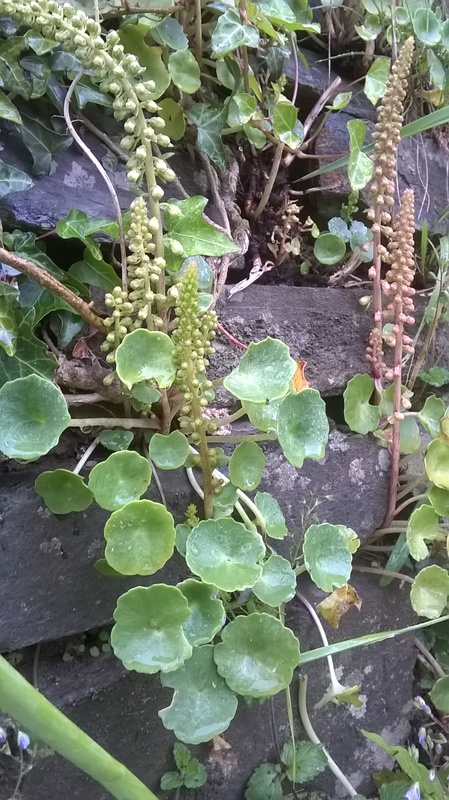 Thus navelwort referred to this property (though under the doctrine of signatures – they would also have been saying – ‘look at me, I’m for use on the navel!’) Oddly, this use doesn’t seem to be generally mentioned in online sources, so maybe it’s a very old use, perfect for my story. It seems that these can also be carefully dried and stored for babies that arrived out of the navelwort-growing season too. Now I am really hoping this plant in a real native as I am sure this could work its way naturally into Dominica’s medicine kit. have you ever eaten a pennywort sandwich – or even just nibbled a leaf? Or do you know these plants by any other names? Do share – you know I love to hear from you! Pennywort sandwich….remind me never to go on a picnic with you! Hi Christine, LOL. . .you wouldn’t like the nettle soup or the sorrel salad then either? Mind you the boys would just eat nettle leaves as they were. . to show off to their friends – not because they were starving!! Loved the post, very interesting. Sorry to hear of family probs, sounds as though things are getting better.